Once again I was heading across the Southwest Desert in the middle of July on my way to Telluride, CO, temperatures baking the desert landscape as one might expect. To give the van a fighting chance, I didn't leave San Jose until 4p, hoping to do most of the desert driving at night - it didn't help much. It was 108F in Baker at 11p and 103F in Las Vegas at midnight. I was thrilled to find the temperature dropping significantly as I drove into the Spring Mtns northwest of Vegas, finally settling at 68F when I reached the highpoint of SR158 at 8,400ft where I would start the hike the next day. Despite the cars driving by at night and the hiking group that assembled outside the van at 5a, I slept well and it was far better than trying to find someplace to sleep just outside of town. I chose the North Loop TH as the best point to start a loop of Mummy Mtn that would take in five summits, all of them on the LV 52 Peaks Club list. Things didn't turn out as planned, but it was still enjoyable. Starting just before 6:30a, I hiked about three miles up the trail, gaining 1,500ft to reach the Raintree (a large bristlecone pine) found at a trail junction below Mummys Toe. I turned right towards Mummy Spring, intending to follow a GPX track I had downloaded from PB to reach Mummys Toe. The track was mildly helpful but I didn't use it much. Upon reaching Mummy Spring about 1/3mi from the junction, I started directly up from there, shortcutting the trail that goes past the spring before switchbacking up the drainage. I intercepted the trail not far above the spring and followed this nearly to the crest. 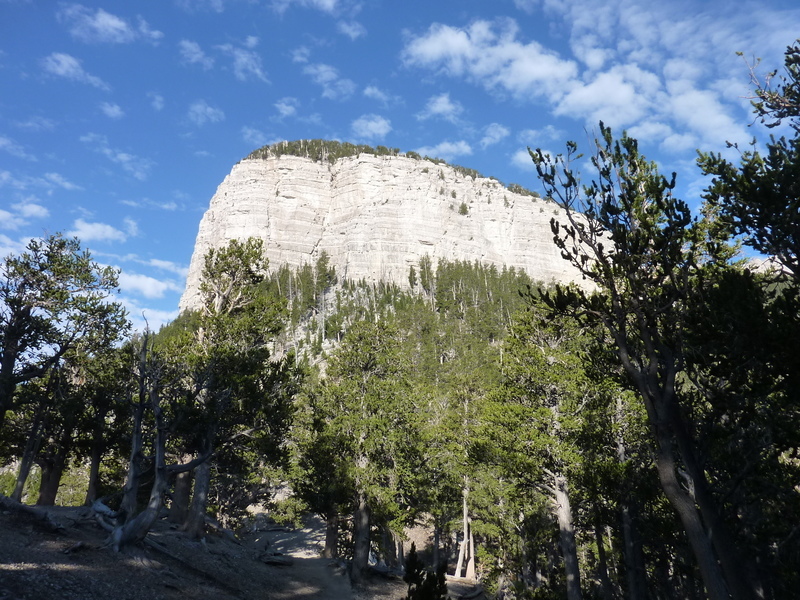 As one gets closer, it becomes more apparent that the whole of Mummy Mtn is comprised of mainly limestone rock with significant cliffs ringing large portions of the upper mountain. I turned left off the trail before reaching the first of the cliffs and followed a use trail along the ridgeline connecting Mummy Mtn to Mummys Toe. It took just under 2.5hrs to reach the summit, none of it more than class 2 though some sections are rather steep. I signed the busy register and took a few early morning photos looking south to Griffith Peak and west to Mt. Charleston. Henry the Mountain Man (PB avatar) had left a curious page from 2013 for a "Spring Mtn Challenge" that takes the Sierra Challenge a step further - "11 peaks in 11 days". I don't know if I was the inspiration for this idea, but I found it amusing. Sadly, there were no signatures inside the page where entry lines were provided, so I suspect it wasn't a big hit. Well before 9a, it seemed I would have plenty of time for the rest of the day's agenda. I returned along the use trail and picked up the sometimes fading, sometimes braiding trail leading to Mummy Mtn. The trail does a good job of skirting along the base of the vertical cliffs before finding a narrow gully that provides one of the few breaks in the cliff system. This gully becomes class 3 near the exit (which is to the right of the main gully) - if you miss this turn you'll end up at the ridge without a way to climb further upwards. After the class 3 section (where I found and removed some old slings), the trail continues traversing along the cliffs before finding a last class 2 exit gully that leaves you a short distance from the summit. This register, too, was busy, a rubber snake guarding the contents from the unsuspecting visitors when they open it. It was now only 10a and I figured I'd be able to nab the other three summits and be back by 2p, 3p at the latest. After starting north across the easy summit plateau, the plan slowly began to fall apart. The problem, I came to find, is a significant ring of cliffs making it difficult to get down to the saddle with Mummys Chin. My cavalier attitude ended with the easy terrain and I found myself staring down at some difficulties. I continued along the ridge, hoping to discover one or more weaknesses that would let me get through the cliffs. With much effort, I descended some sketchy class 4ish stuff and worked my way further north, yard by yard. I tried at least three different escape routes, finding myself stymied each time. I was within a quarter mile of Mummys Chin and less than 100yds from the saddle via which I could see a straightforward way to the next summit. A pair of climbing shoes and slightly larger cajones would have helped, but I backed off each time I started to get a lost feeling in my stomach. I found myself getting frustrated and paused to consider why. I know there are easier routes from the other side of these summits out of Lee Canyon, so it wasn't like I was going to be denied other than just for today. There was no compelling reason I had to reach them today - I had eleven days before joining my friends in Telluride, so an extra day or two was no big deal. Once I acknowledged this, I immediately started enjoying it more. The scrambling was exciting and I was getting lots of playtime on the limestone. I ended up spending an hour and a half exploring the cliffs without finding a way through, eventually having to return nearly to the summit of Mummy Mtn to return via the trail I had started on. There may have been an escape route down the North Fork of Deer Creek drainage, but I couldn't see the route clearly down the steep initial gully. I was too tired by that time and would leave that route possibility as an exercise for future explorers. Anyway, I came to find why I had found no GPX track linking Mummy Mtn and Mummys Chin - a toughie, that one. It's good to see you getting out of California again, to places with real peaks you haven't climbed. Even the best writing can't do much to make the ascent of unnamed 1760+' sound exciting. There is a way over there. One must head more to the left as you leave the main summit and there is a series of rubble covered ramps and ledges that will take you to the saddle between the two peaks. Not technical (no worse than easy class 3), but it's tedious.